Find anything in your portal - instantly! Search everything on your portal!! Names, notes, files, even words in pictures! Ever spent time looking for that one paper that had that detail somewhere and your boss wants it now? Ever argued about the cost because you couldn't find the email with the quote? Ever spent hours searching for that picture of you by the sign with your name on it? Now it's easy and painless!! Our Secure Document Search Engine searches everything in your portal, whether it was a document, name, note, PDF or scanned document, you can find it with the click of a button! What makes it even better? It's fast! Like lightning. Ka-Chow!! With PortalsXpress, each of your contacts has a "digital file" linked to it where you can store documents, pictures, spreadsheets, slideshow presentations, accounting files, tax forms, email messages, contact notes, projects, tasks, movies, music files -- any file format that's out there. In addition, there's an area where you can store documents related to your organization. Keeping your documents organized usually makes it easy to find them. But invariably, everyone eventually finds themselves in the position where they can't find a document that they're looking for. Maybe the document was misfiled; perhaps it's unclear where the document belongs. Or maybe someone else filed the document and their organizational methods differ from your own. When that happens, it can take hours or sometimes even days before that document turns up. That's where our Secure Document Search Engine comes in. Anytime a document is added to your portal, it's scanned and indexed. But unlike most of the current search systems on modern desktop computers, our engine takes it one step further. Our PDF scanner reads text from uploaded PDF files and indexes them. Our OCR reads text from PDF scanned documents and other image files and indexes them as well. The result is an astoundingly effective search engine that makes it possible to find any file in your portal using just a keyword or two. 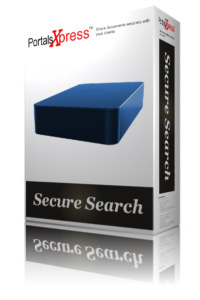 Customers using our Secure Document Search Engine have found it to be an invaluable addition to the way that they do business. In fact, many have told us that they couldn't imagine life without it. We're confident that, once you've gotten used to having a tool as powerful as our Secure Document Search Engine at your disposal, you'll be just as ecstatic about it as we are!